This recipe is a house classic – I can’t count the number of times I have made it over the last 3 years. It is also my go-to recipe for foreign guests visiting Australia. Indeed, Barramundi is an Australian icon: it is probably Australia’s favourite fish and is of great significance to Aboriginal people. This recipe is also an impressive display of the beautifully fresh ingredients available in this country. I highly recommend pan-fried Barramundi to both crispy-skin fans and beginner cooks. 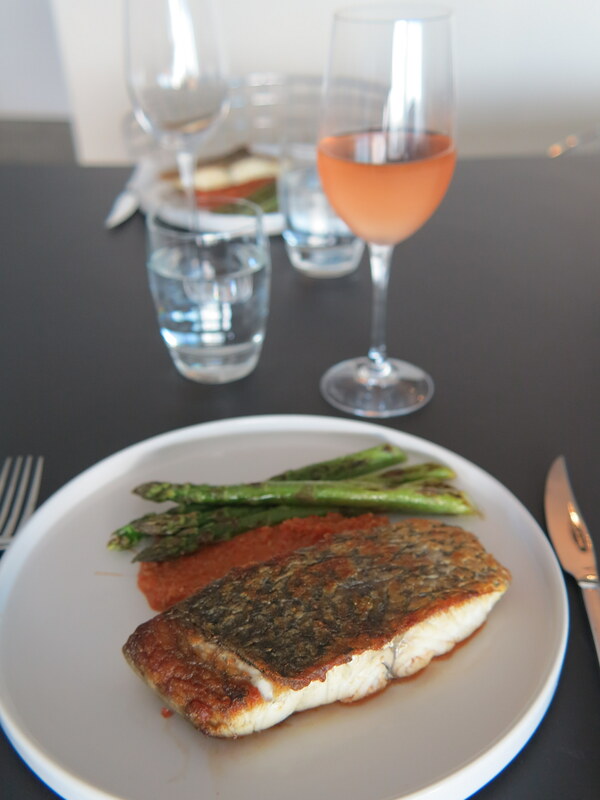 Indeed, Barramundi has got a fantastic ability to crisp up and is quite hard to overcook as it cooks relatively slowly. The capsicum salsa recipe is a tweaked version of a recipe published on www.taste.com.au. 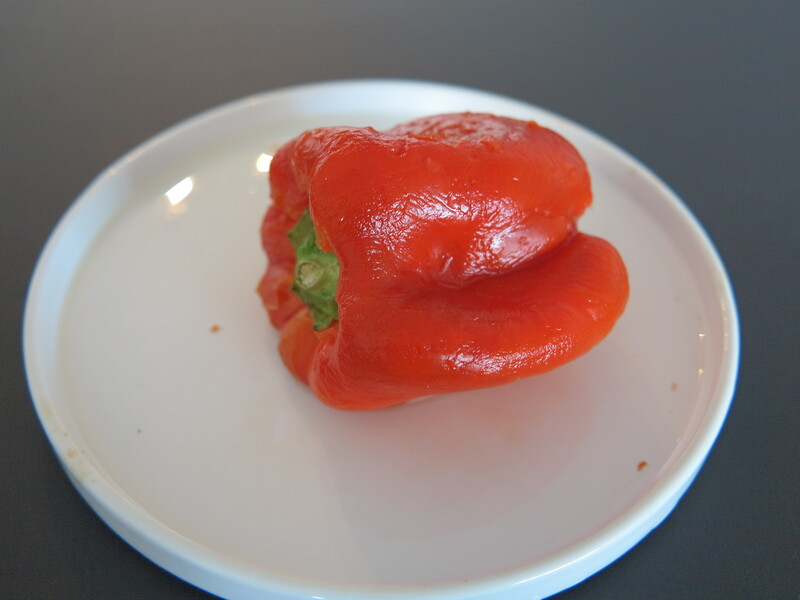 Step 1 – Roast and skin the capsicum: This step can be done in advance. Place a sheet of baking paper on the oven tray and pre-heat the oven to 200 degrees for 5 minutes. Place the capsicum in the oven and cook for 25 to 30 minutes. 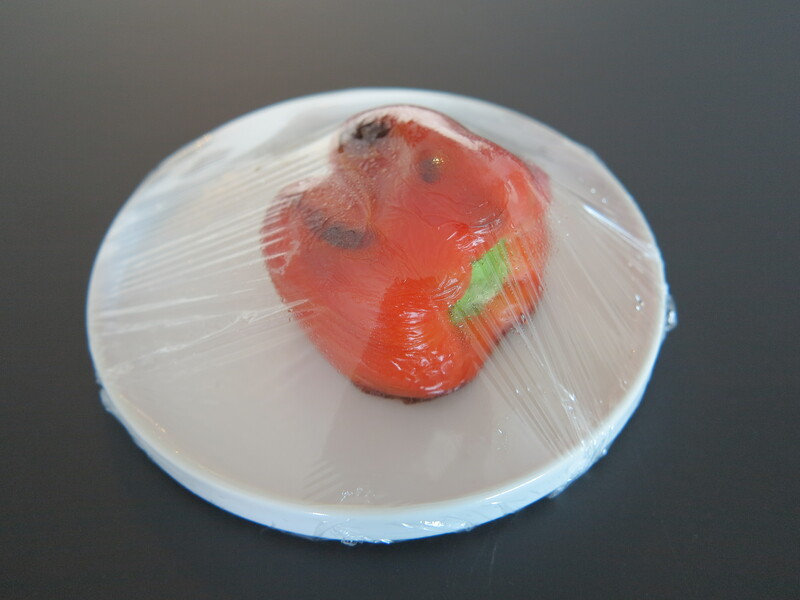 Once the capsicum looks roasted, place it on a plate and cover with cling film. Leave to rest for 15 minutes. The steam created via this process will lift the skin of the capsicum which should then come off easily. 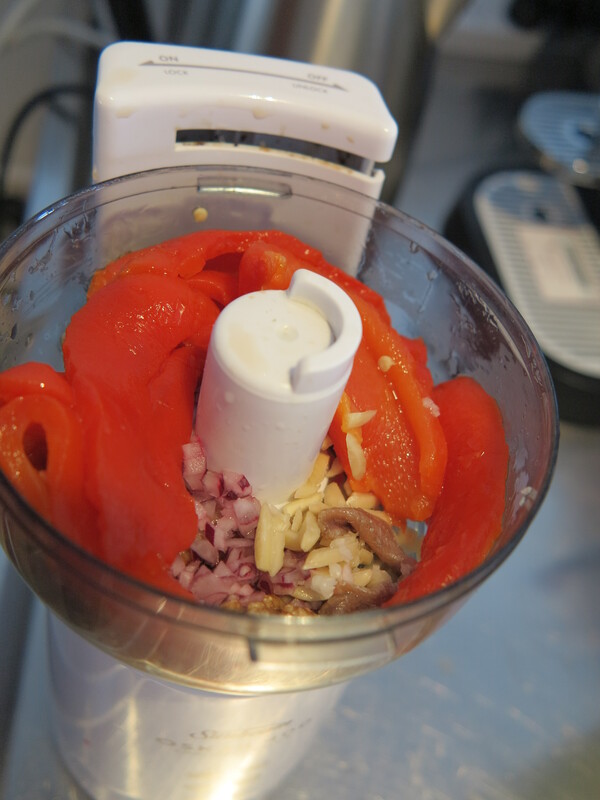 Step 2 – Prepare the capsicum salsa: cut the roasted capsicum into pieces and place into a blender together with 1.5 tbsp each of silvered almonds and walnuts, 1/2 a red onion and 1/2 a clove of garlic, roughly chopped, the juice of 1/2 lemon, and a few drops of orange blossom water. Drain the anchovies by patting them with paper towels and add them into the blender. Blend until you obtain a fairly fine mixture and transfer into a small saucepan. Please note that the next 3 steps 3.a, 3.b and 3.c should happen somewhat concurrently. 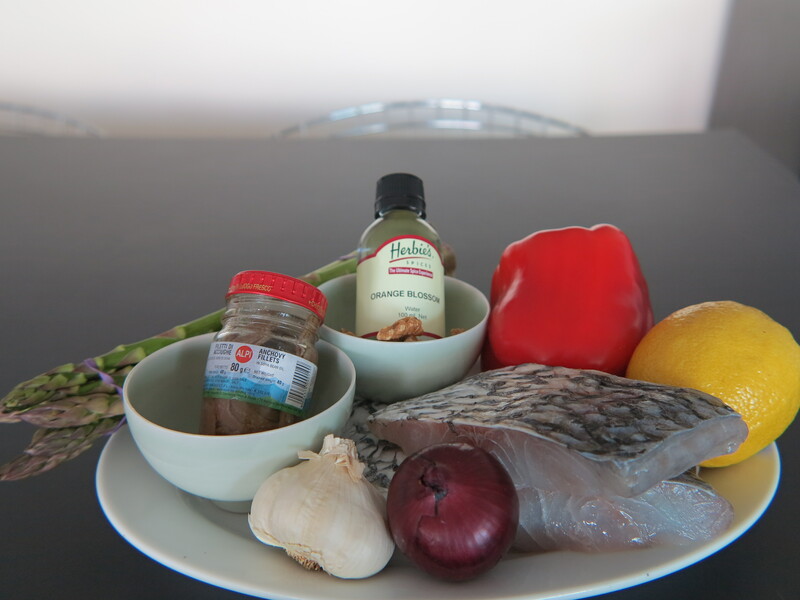 Step 3.a – Pan-fry the fish*: rub the pieces of Barramundi with 1/2 tbsp of olive oil. Heat 1 tbsp of olive oil in a frying pan. 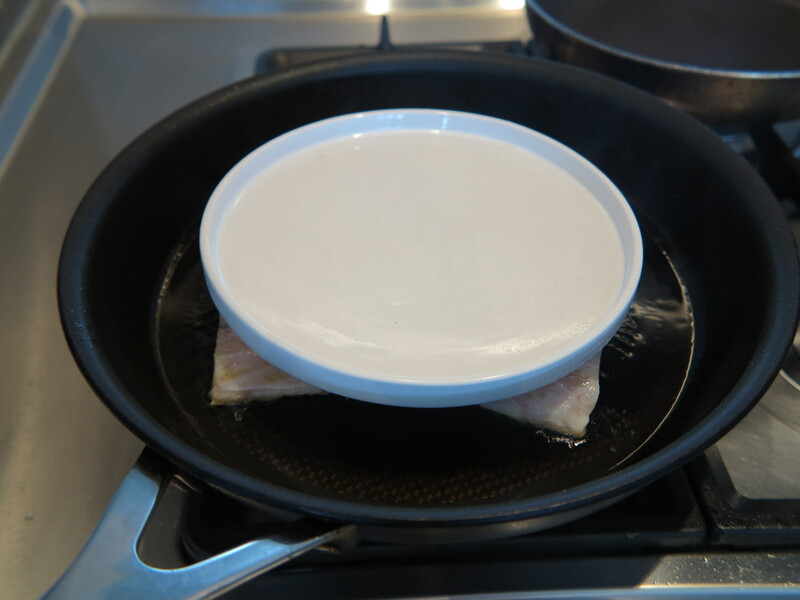 Once hot – when you can see a bit of smoke, add the fish fillets, skin down, and hold them flat with a small plate as per the photo below. This will ensure even cooking by preventing the fillets from curling. Cook for 3 minutes and then flip the fish fillets onto the other side and cook for another 2 minutes. At that stage the fish fillets should look golden from the outside but will still be raw on the inside (see photo below). 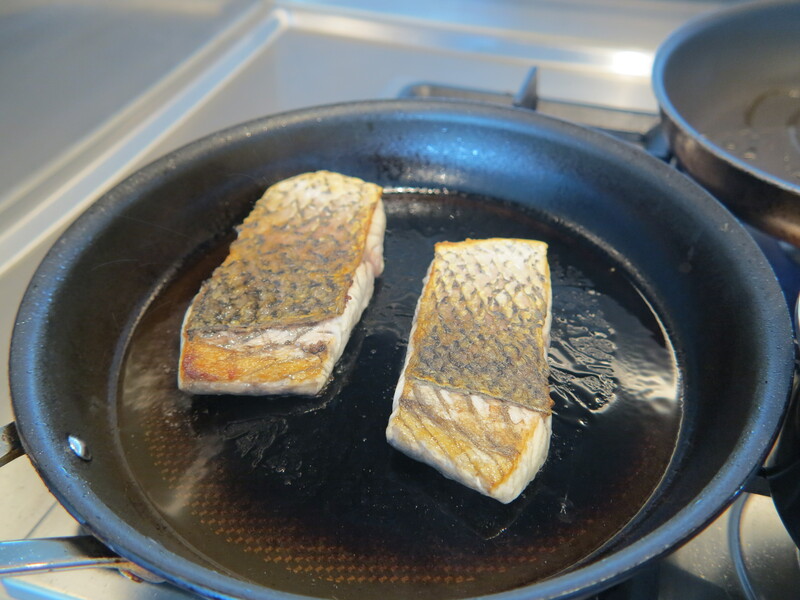 Reduce the heat to medium, flip the fish fillets back onto the skin side and cover the frying pan with a lid. It works without a lid as well but it takes longer. Cook for another 3 minutes or so. The cooking time will depend on the thickness of the fillets. Check regularly to make sure the skin isn’t burning. Don’t hesitate to use a knife to check the level of doneness. The fillets are cooked when the skin is crispy and the flesh an opaque white, but still very moist. Season to taste. Step 3.b – Pan-fry the asparagus*: This step should occur concurrently to step 3.a. Wash the asparagus thoroughly, drain and cut off the ends at an angle. Heat 1 tbsp of olive oil in a frying pan. Once hot – when you can see a bit of smoke – place the asparagus in the frying pan. Cook for 5 minutes turning the asparagus regularly. Season with salt and pepper. Step 3.c – Reheat the capsicum salsa* (optional): This step should occur concurrently to step 3.a and 3.b. I like to reheat the capsicum salsa on low heat for 5 minutes not only because it is lovely to eat it warm, but also because the cooking process softens the flavour of the onion and garlic. 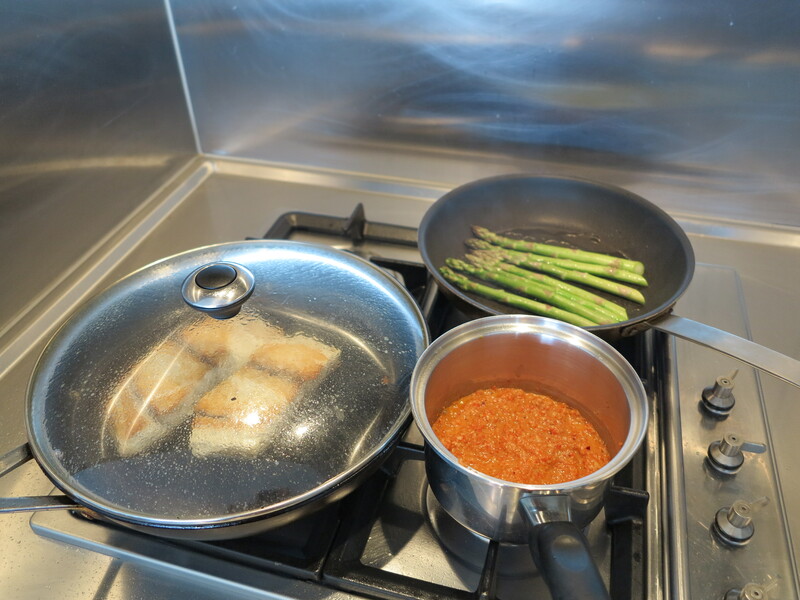 Step 6 – Serve: Place the capsicum salsa, the fish fillets and the asparagus onto two plates and drizzle with lemon juice. Barramundi can be replaced by all kind of white fish such as Snapper, Kingfish or John Dory, but I believe Barramundi is the best widely available option for no fuss crispy skin. Please keep in mind that the cooking times can widely differ depending on the type of fish. If green asparagus aren’t in season, green beans or broccoli would be also be a great match to the capsicum salsa. This capsicum salsa is also a fantastic match to grilled chicken. I recommend a Sauvignon Blanc, a Riesling or a French rose. How to identify a fresh piece of fish? It should have a firm texture, a glossy look, should not be brown around the edges and should only have a slight fishy smell. How to obtain a nice crispy skin? Use a generous quantity of olive oil and make sure that the pan is really hot (smoking) before adding the fish. Use a small plate to hold the fish fillets flat and do not move the fish fillets for the first few minutes of the cooking time to avoid breaking the skin. Pan-frying green vegetables is not only quick but also healthy. Yes, it does requires a bit of oil, but it is a very efficient technique to retain the vitamins and nutrients. This capsicum salsa is as healthy as a sauce will ever get…it’s full of vitamins and antioxidants! Capsicum is a great source of vitamin C, walnuts of omega 3, almonds of vitamin E, anchovies of copper and selenium, garlic of manganese, phosphorus, potassium, copper, selenium, vitamin B6 and vitamin C, and onion of potassium, vitamin B6, vitamin C and quercetin amongst others! 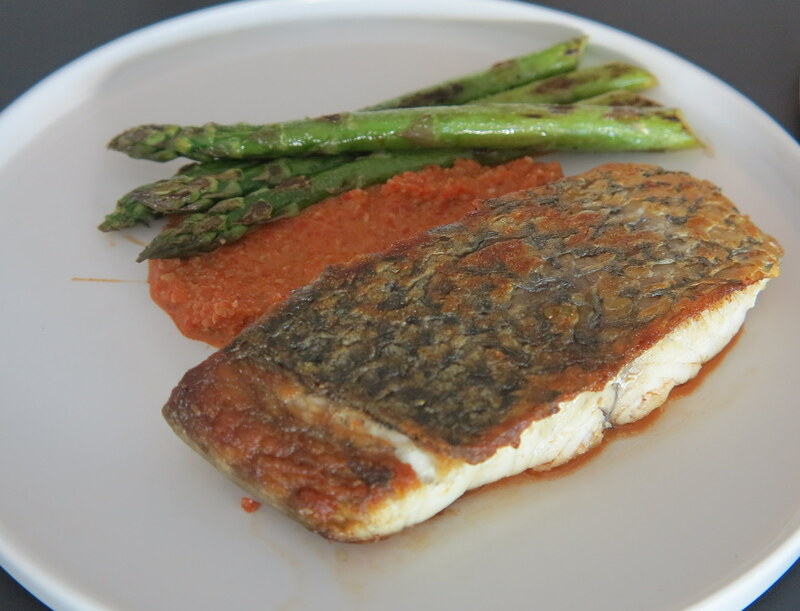 Gallery | This entry was posted in Recipes and tagged Asparagus, Barramundi, Capsicum, Crispy Skin, fish, healthy, Nuts, Salsa. Bookmark the permalink. What a great recipe and it looks so simple to make. I’ll definitely give it a go. I love the “Did you Know” tips. i love barramundi with lychee salsa. sooo good. Thanks for sharing Holly. The lychee salsa looks delicious indeed…and healthy too!